This pie safe belonged to my great uncle, Asia George -- "AG". It was handed down to my Mom who loved him dearly and who helped look after him in his later years. He was such a sweetheart. I "antiqued" it green, added the panel and painted the rabbits on it a hundred years ago -- during her "rabbit" phase. Now that we're redoing her sunroom, it's time for a makeover. Mom was a little timid about my painting over the rabbits. It was a little like erasing and drawing over a master piece I created in kindergarten for her. I, on the other hand, rolled creamy paint over them without even looking back. We wanted something simple. Elegant. We've obviously moved into our bird phase. I used a method I've used a couple of times before and birds I found on one of my very favorite sites -- The Graphics Fairy. You can check out my instructions *here*. The room is coming together. The new curtain panels look awesome. I'll share some how-to's and after pictures later. A new life in a new decade that's what I say! 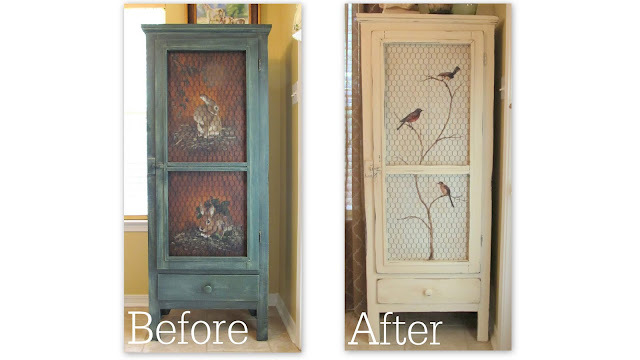 I'm sure those bunnines were loved for a long time, and now this treasure-of-a cabinet will be love again with a whole new look. I love it, Lindy! Of course, I loved it with the rabbits, too, because I am a bunny collector, but I also like the lightness of it now. Well, in this case..I loved the before and the after. I can see why your Mom didn't want it painted it over but can also see why you wanted to. IT turned out really lovely. Oh my goodness!! What a difference! I absolutely LOVE it! !I love that cream color. Perfect! The rabbits were so cute but they just don't come close to the birdies...love, love, love it! I have to say that I loved the before and I adore the after! You truly are talented. It is completely Charming, both before and after, but I do prefer the after just a tad more. Looks very nice, so was the before! ooh the after is SOOOO much better! great job, lindy! I would have cringed like your mama since I love rabbits but I also LOVE the birds as well! You are truly talented! Glad to see you are feeling better! I love the new look so, so much! Really beautiful. I love the bunnies and the birds-both are fabulous. The sunroom is looking great-can't wait for more pictures. Beautiful transformation Lindy. Love it! I'm off to go check out your instructions now. Thanks! That 'is a beautifull idea! Love it! so pretty! I found your blog through a link party and LOVE it! I am your newest follower and would love it if you would check out my blog and follow me too! Thanks! Well I'm a lover of all things bunnies but your transformation of this piece is beautiful and fresh looking. Thanks for sharing. Lindy, I love the birds on this cabinet and it is perfect for a sunroom. Beautiful! Thank you for joining my party this week and take care. love the curtains also. Really look great. Love the transformation! You did an amazing job!!! Love it!!! The birds look great! Visiting from FJI. What a nice redesign! Love the distressed finish! Oh my goodness, the rabbits were adorable but the birds are fabulous. It was a win win situation. I love it! Sooo beautiful! Loved the before, but that after is drop dead stunning! It's beautiful, I love the transformation! Another project of yours that I absolutely adore!! Beautifully done! what's holding the panels up?? i love it! Oh, this is gorgeous! I love it. I love how light and simple this version is. You are quite an artist! Beautiful makeover and beautiful piece! I never knew it was called a pie safe. It's stunning! It looked nice before but you did a wonderful make-over to it. Love the birds and the new colour of it better. Well done! Delightful revamp though I confess to loving the rabbits just as much! Love what you did to it and now you have it to treasure and hand down thru your family! You are so good at painting branches. I have tried to do this before and it looked ... well, terrible. What a great talent to have. Thanks for sharing it with the rest of us! This cabinet turned out really cute! I really like the lighter color. Wow, this is beautiful. You did an awesome job on the branches, so pretty. You are clever and talented. The project is lovely and I like the way it is placed in the room, and how it is accessorize.